This unidentified rifle officer is wearing a frock coat and a kepi (forage cap) with a vertical bugle, an insignia associated with riflemen. By 1861 special rifle units were obsolete in that the rifle was the standard arm for all Regular Army infantry units. Since the time of the Revolutionary War specialized rifle units had existed along side of the standard infantry units who were armed with smoothbore muskets. These units were used as skirmishers and could be very effective. Despite its more accurate fire, the rifle also suffered from disadvantages as a military weapon. By 1861 technical improvements allowed the rifle to totally replace the musket. However, there was a long tradition of rifle units both in the Regular Army and state militias. It should be no surprise that these units did not immediately drop the title riflemen and the associated insignia. On May 19, 1846 Congress approved the creation of a Regiment of Mounted Riflemen. General Orders Number Two of February 13, 1850 authorized a perpendicular trumpet as the headgear insignia of mounted rifles. In 1861 the Regular Army Regiment of Mounted Riflemen was in the Department of New Mexico. On August 3, 1861 this unit was renamed the Third Cavalry Regiment and the mounted rifle headgear insignia and green branch color were replaced by cavalry insignia and colors. In September 1862 they moved east and served with the western armies for the remainder of the war. Foot rifle units had also existed in the Regular Army. One or more Regiments of Riflemen were authorized 1808-1821 and 1843-1844. A Regiment of Voltigeurs and Foot Riflemen existed 1847-1848. These earlier foot rifle units are not known to have used the trumpet as an insignia. It is interesting that the term "Foot Riflemen" can still be found in the 1861 regulations despite the fact that no such branch existed in the Regular Army at the time. However, there were a number of foot riflemen units within state militias. Many of these units wore the trumpet insignia and the green branch color of riflemen. The above image was taken in Boston and within the prewar Massachusetts militia were four battalions of foot riflemen. One of these battalions (the Third) was mustered into federal service in 1861 for three months. It is possible that the rifle officer of our photograph was a member of one of these units. The resolution of the image does not allow us to say if the filled in area within the trumpet is the number of the unit or just a tassel. Only a few surviving examples of the insignia have a number. 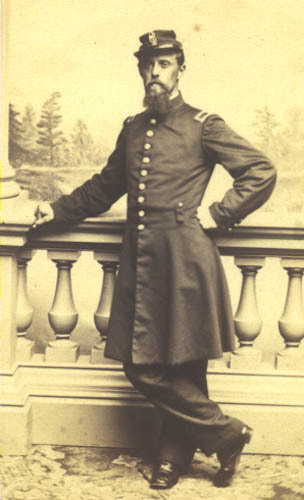 The image shows an officer wearing a kepi, a headgear item that did not become common until the eve of the Civil War. 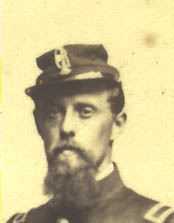 It is likely that the image dates to the 1858-1861 period. The riflemen trumpet insignia disappeared from use during the war. The volunteer sharpshooter regiments, focused on marksmanship, that came into being during the war picked up the green branch color of riflemen, but not the vertical trumpet insignia. They were the brainchild of Hiram Berdan and did not have the status of a formal branch of service. They should not be viewed as the linear descendants of riflemen units even if they were used in a similar way.